Handiwork explores the relationship between writing and torture—the ways poetry can wound us, and the ways it wrestles with language itself. Combining constraint-based writing with fragmented lyricism, the book considers the social and cultural role of the writer with respect to history and memory, and what gets lost in the transmission of trauma from one generation to the next. “A New Vessel,” one of the poems from the manuscript, was selected by Ilya Kaminsky as winner of the 2011 Gulf Coast Prize. An audio recording of “The Smell of Rain on Surfaces” is at InDigest, “Five Simple Machines” is at The Poetry Project, and “A Show of Hands” is part of the 2012 MLA marathon reading. I also read from and discussed the book as part of an interview with Leonard Schwartz for his Cross Cultural Poetics podcast, and as part of a reading I gave with Andy Fitch at the Segue Series. Videos of me reading from the book include a selection from the final section, “Tonal Saw,” for InDigest’s “Last Reading on Earth Ever: A Marathon of Apocalyptic Writing” series, a few poems for the FREQUENCY series (video by Amish Trivedi), and several others as part of Evergreen State College’s Art Lecture series. “Character Anatomy,” Split This Rock (July 9, 2014). “A New Vessel,” Gulf Coast 24.1 (2012). “The Cooper’s Sleep-Work,” “□: A Translation,” and “Five Simple Machines,” The Offending Adam 94.1 (March 2012). “Mind Like A Bone-Orchid Fed On Shale,” “Show of Hands,” and one Salt Gematria poem, Elective Affinities (August 2012). “Strasznamama,” “Lay Your Gaping Switchblade Back,” one Salt Gematria poem, and a poetics statement, PoetryNet (September, 2012). “What Is Withheld,” Boston Area Small Press and Poetry Scene Blog (May 27, 2012). “Blind Contour,” The Destroyer 1.1 (2011). “What Is Withheld,” Pen America Blog (2011). These poems from Handiwork are crudely-wrought. Ronald Johnson famously said of his brilliant erasure text Radi Os, “I composed the holes.” I wanted to work with holes in this book—to leave gaps for the unsaid and the unsayable. Therefore, I think of it as a cold book that keeps trying to get warm. BecauseHandiwork treats the juncture between personal and cultural history (one series of lyrics mythologizes family stories about the Holocaust and another series of erasures draws on actual stories my grandmother wrote about her survival), I tried to avoid coherence, which seemed unfaithful to my actual experience of how these tales are transmitted. History is problematic, and so is subjectivity, so I try to acknowledge my own complicity in mangling this material through the hand poems that run through the manuscript. I also try to scatter salt throughout the book—as offering and as curative. In the salt gematria poems, all titled with an empty square, I use mathematical constraint and sound play to suggest the possibility of healing through/despite a language so fraught with problems. Even if words don’t do the things we mean them to, perhaps their very disobedience can be fruitful. Josh Kanaga, Ronni Davis, Sarah Rose Goldfinch, and David Kim at The First Experiment #4. Ngoho Reavey. “Handiwork.” Galatea Resurrects #23 (Dec. 2014). Lucy Biederman.“Handiwork.” Jewish Book Council (Jan. 2014). Aaron McCollough. 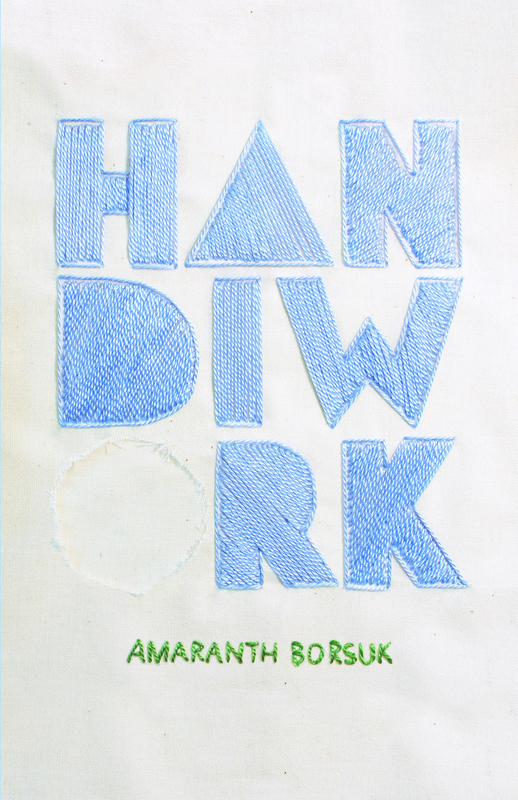 “A Review of Amaranth Borsuk’s Handiwork.” Jacket2 (Oct. 2013). Angela Veronica Wong. “Handiwork, by Amaranth Borsuk.” The Aviary (May 2012). Irene Koronas. “Handiwork.” Wilderness House Literary Review 7/2 (May 2012).